Comedy. Love. Zombies. A unique show with a memorable name—backed by behind-the-scenes administrative improvements—helped The Academy Drum and Bugle Corps and its Executive Director Mark Richardson reach new heights this season. For the first time in its 15-year history, the Academy Drum and Bugle Corps reached finals at Drum Corps International World Championships, placing 11th. 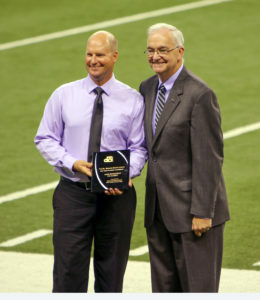 Executive Director Mark Richardson also received the Dr. Bernard Baggs Leadership Award. Richardson discusses the corps’ history and how its dedicated members and unique show allowed the ensemble to achieve its highest ranking. Richardson: I am a third-generation Arizona music educator. My grandfather was a band director in Tucson; my father became a band director around Phoenix; I got my degree in music education at Arizona State University. I [spent] a lot of time watching drum and bugle corps over the summers with my family, but I didn’t end up marching drum corps until my age-out year in 1996. Halftime: Could you share some of the history of the Academy Drum and Bugle Corps? So we started the process of incorporating, and in 2001 our first step was to bring awareness and to inspire some kids to be excited about it. The first three years of our organization was a small youth guard program, a summer brass/percussion ensemble, and then the drum corps show. 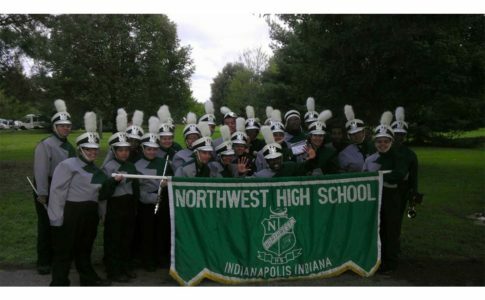 In 2004 we petitioned Drum Corps International to become a Division II competing unit. We continued to be Division II through 2006 when we did World Championships for the first time and ended up as Division II World Champions. At the end of that season, we petitioned to become Division I [now called World Class]. Halftime: How did the corps come up with its unique show, “Drum Corpse Bride,” this year? Richardson: The idea came from our primary designer, Michael Townsend. 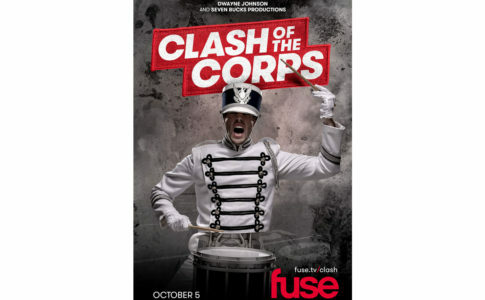 He always thought about doing a show that would laugh at the fact that everybody mispronounces drum and bugle corps as “corp” [with a “p” sound] or “corpse.” It spawned off of that humorous take, so we made it a zombie love story. We didn’t want this to be “The Walking Dead” show; it needs to be like a Tim Burton film. The characters may be gruesome by nature, but the way they’re portrayed makes them endearing. 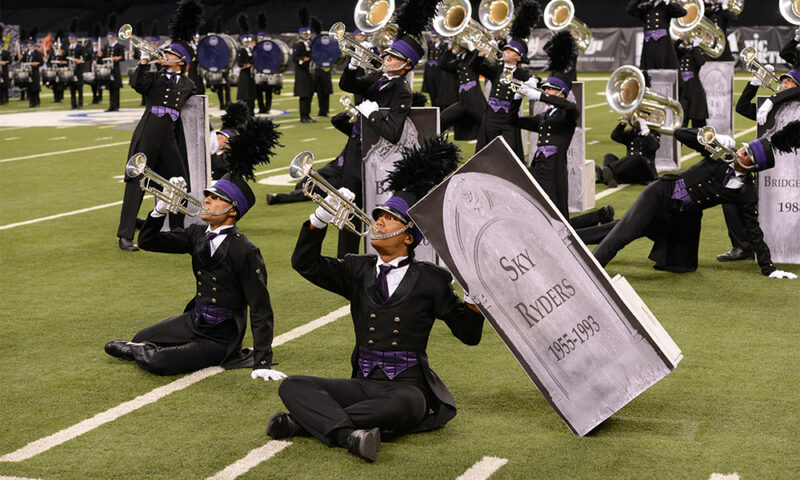 Halftime: We noticed that some of the props in the show were tombstones, and that they were part of a fundraising plan. Tell us about that. Richardson: Early on we wanted to have this wedding setting, so we wanted to have chairs out. As we were looking at designs and how they would function on the field, there was a chair that had a flat back, and our designer suggested that we have tombstones on the backs that we reveal. The juxtaposition of wedding pews with cemetery plots would be a great play on the dichotomy of the show. We decided to put the names of couples from famous love stories on them. Then we thought that people may be interested in putting their names on, and for the last couple weeks of the season, we offered the opportunity. We ended up having names of people’s relatives, previous directors, drum corps that no longer exist, and members who have aged out. Halftime: How did the Academy prepare throughout this season that allowed it to become a World Class finalist for the first time? Richardson: We had discussions as to what went well last year and what could be better. Communication was one thing, making sure that there was strong communication between staff and band members. We got to move in as a full corps earlier than ever before. We had a really focused approach, and we were as strong as we’ve ever been for the first competition. Halftime: What were the proudest moments of the season or during your time with the corps? Richardson: I am proud of how we operated for the entire summer, which got us to the moment of making finals. It’s a memory I’ll never forget, finally knowing on Friday night that we were awarded the opportunity to compete on Saturday for the first time and get on the grand stage. Also back in 2004 competing on the drum corps stage for the very first time as a Division II corps is another moment I’ll never forget either. Halftime: Congratulations on winning the Dr. Bernard Baggs Leadership Award. What was your reaction? Richardson: It’s a huge honor. Nobody knows what a drum corps director goes through other than other drum corps directors. When your peers recognize the efforts you’ve put in, it feels humbling. Halftime: What advice do you have for musicians or other band directors? Richardson: Surround yourself with quality people who have great spirit and understand your mission, and if they’ve got that mindset, and they’re successful in their own right, then I think they’re going to bring great things. Photo of Academy Drum and Bugle Corps courtesy of Ken Martinson/Marching.com. Photo of Mark Richardson courtesy of Kellie McDaniel.